From wind power to hybrid vehicles to consumer electronics to medical devices, ultracaps are making energy storage systems more powerful. Ioxus CEO Mark McGough works out of the company’s production facility in Oneonta, New York, a half-hour away from the Baseball Hall of Fame in Cooperstown. McGough's business is ultracapacitors, a technology that just might be the home run that energy storage systems need. They are more powerful, have more energy, and have higher voltage than traditional batteries. They can store energy electrostatically instead of chemically the way a battery does (see Report on Ultracapacitors: Major Advances on Tap). Ultracapacitors can charge and discharge a million times with no decline in performance. Batteries, on the other hand, can only repeat the recharging cycle a few hundred to a few thousand times over the course of their lifetime. Plus, in terms of efficiency, ultracapacitors are 95 to 98 percent efficient. This compares favorably to batteries, which are only 60 percent to 70 percent efficient. Therefore, when ultracapacitors are incorporated into the design of a flashlight, the device can charge in just a minute and provide a bright light for hours. “We have the best technology in the ultracapacity space,” said McGough. Plus, he said, the company’s internal design team allows for more creative freedom. “We are very new to the market. We are just introducing our second generation line of products,” said McGough. But the Ioxus team has a 45-year history of making specialty capacitors. 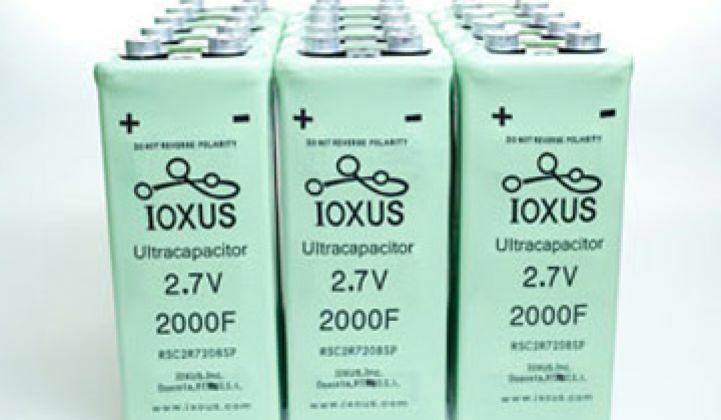 Maxwell Technologies is a competitor, but McGough insists Ioxus’ supercapacitors are up to three times more powerful than what is available commercially. “Companies take small quantities for prototyping. Once they get into production, you’re talking about hundreds of thousands of units for an individual customer,” said McGough. Car manufacturers are faced with the federal government's demand that they improve the fuel efficiency of vehicles. Nearly every car manufacturer is developing a hybrid vehicle. “Ultracapacitors are a major player in the space. It can be the dark horse that takes a significant portion in the electric car market,” he said. By outfitting a car with ultracapacitors, you can change the idle system to a stop-and-start system so you don’t waste gas at every traffic light. In fact, McGough just returned from a wind show in Beijing. While there, McGough heard a rumor that China is going to surpass America in the number of wind turbines by next year. To put this in perspective, the Chinese are building one wind turbine every 90 minutes. The ultracapacitors can be used to direct and steer massive blades in or away from the wind to protect them from getting damaged. Besides hybrid transportation and wind turbines, consumer electronics and medical devices are other likely applications for ultracapacitors.